This is an “after” photo of our recently remodeled 1950’s beach cottage dining room. Here’s what it looked like before, right after we bought the house. 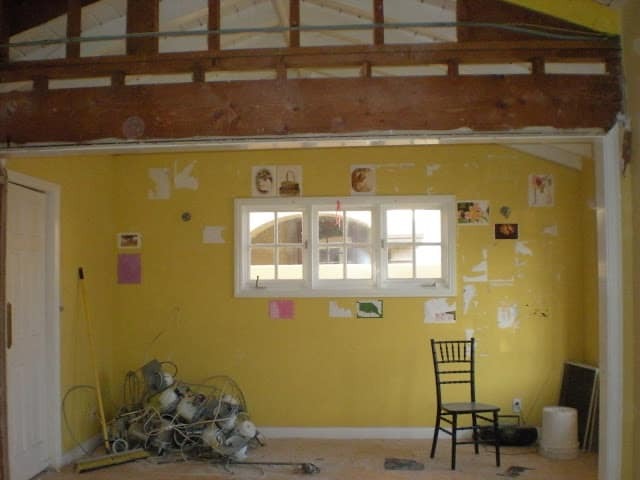 I wanted the window removed to have a feature wall. Plus, we live so close to each other on Lido Isle, you looked right into the neighbor’s front door. The low opening to the dining room was slightly arched to raise it. 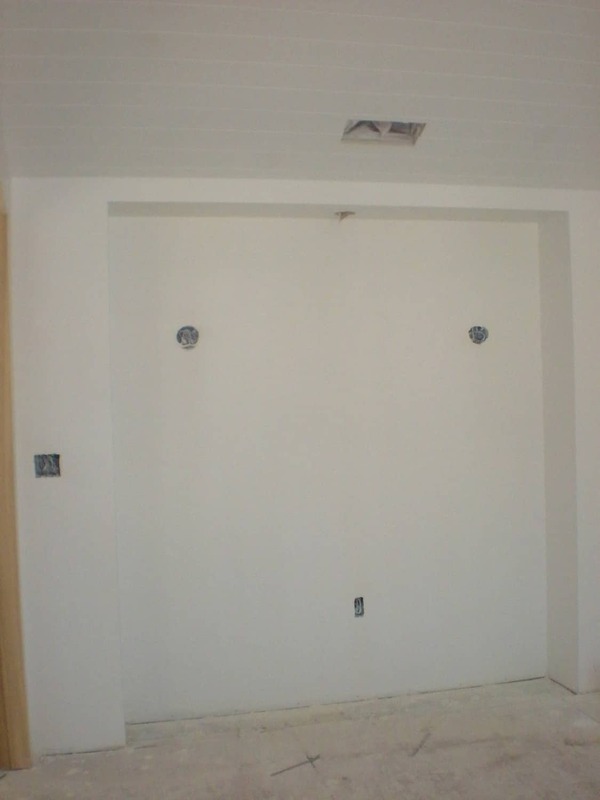 The door to the kitchen on the left was removed so that we could have a walk-in pantry (see here) on the other side. Where the door used to be we created a small alcove. oil painting that we bought in Paris. Janice of the apartment where we lived in Paris. is in our current living room featured here. My mother gave us the antique sconces that I had refurbished. living room mantel and later in the dining room. We moved the peak of the ceiling to center it more in the middle of the room and added a tongue and groove wood treatment. 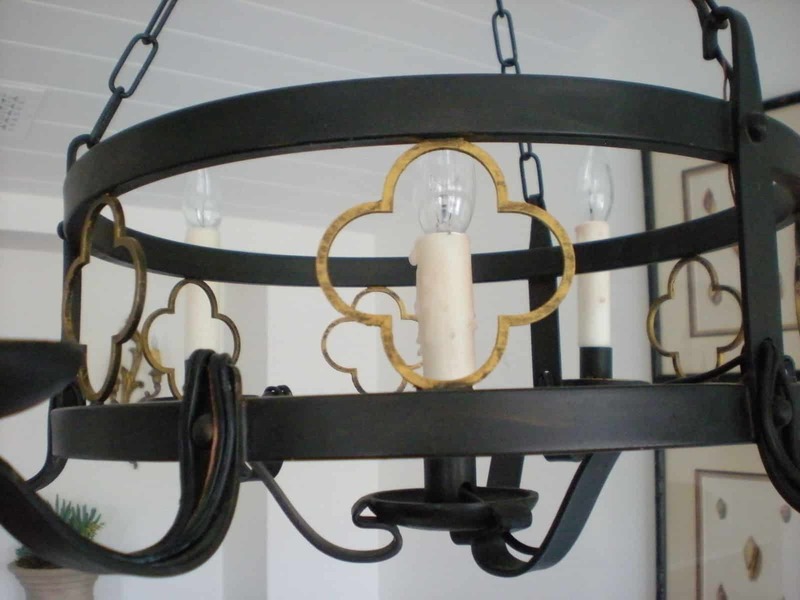 The iron chandelier is from Circa Lighting by Suzanne Kasler. I hand applied some gold to the quatrefoil design and added candle wax covers. “Conchology, the Natural History of Shells” by George Perry, London, 1811.
and also watch the television in the living room. Anyone else watch television during dinner? Have a seat and join us for dinner! I’ll turn off the television. I'd love to join you for dinner tonight. Does six ish sound okay….? What gorgeous things you have. You must have shipped back masses of stuff from Paris. I'm drooling! I love the architectural tweaks you gave the room. It's created such a gorgeous new look. 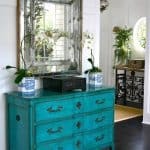 Another beautiful room post! 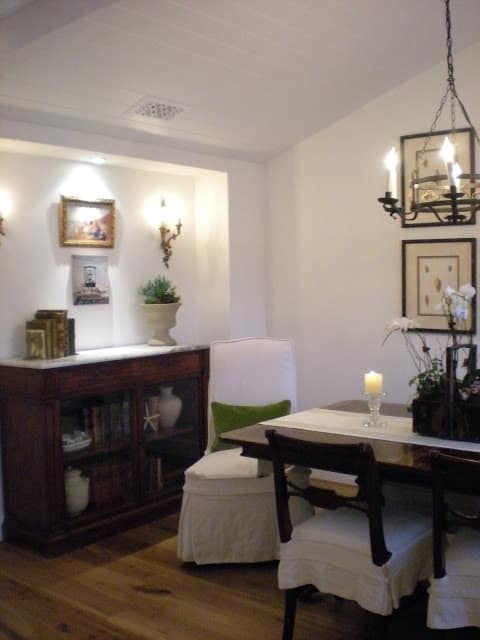 Your remodeling is amazing and your decor is simply timeless. Love it! Mary Ann, I'm available anytime…it just looks fabulous!! Love the way you redid the ceiling with the tongue and groove paneling…the perfect beach touch!! 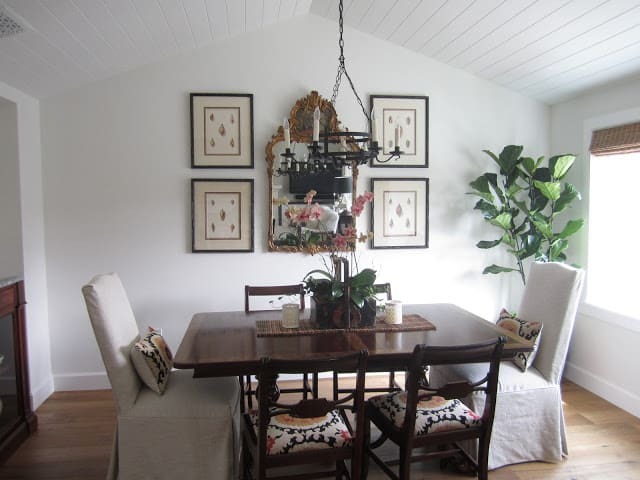 Many Ann – I love your dining room – and that feature wall is beautiful! I love the idea of closing off those windows. The ceiling is gorgeous too! What a classic room! Its gorgeous, love that iron chandelier & the paneled ceiling really changes the sense of the room, timeless classic! Just beautiful. I love the finishing touches like the added gold on the lighting. It's always the finishing touches that make a room special. Stunning, simply stunning. I love everything about it. I have shells around my house too, on shelves and in jars, which might be funny considering I live in the desert. 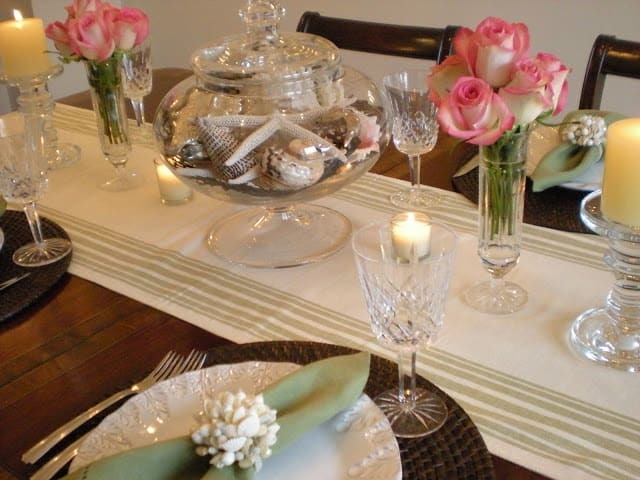 I love the green shade of those pillows, they add just the right pop of color in your elegant dining room. Stopping by thanks to Suzanne at Privet & Holly. Let me just say I love your home! It's a great transformation Mary Ann congratulations. This is certainly one example where getting rid of a window was THE thing to do!!! Great room!! 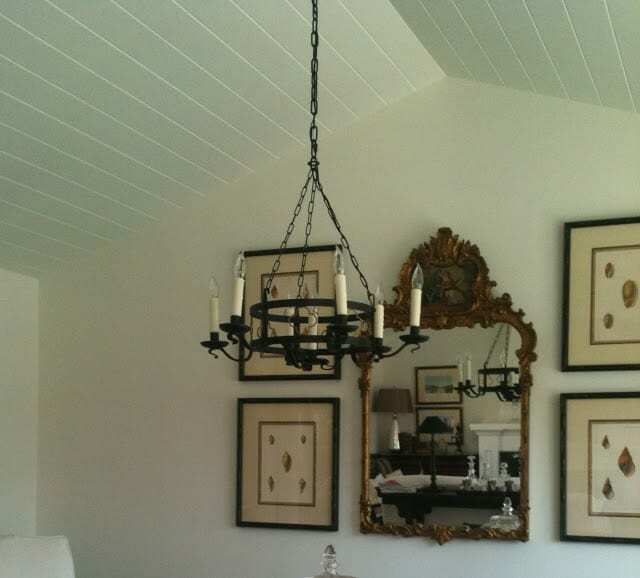 Love the ceiling, the table and the mirror/shell pictures focal point. What a wonderful space Mary Ann! Be right over…what's cooking? 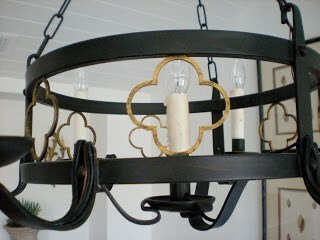 Fabulous…love that you added that touch of gold to the light fixture. 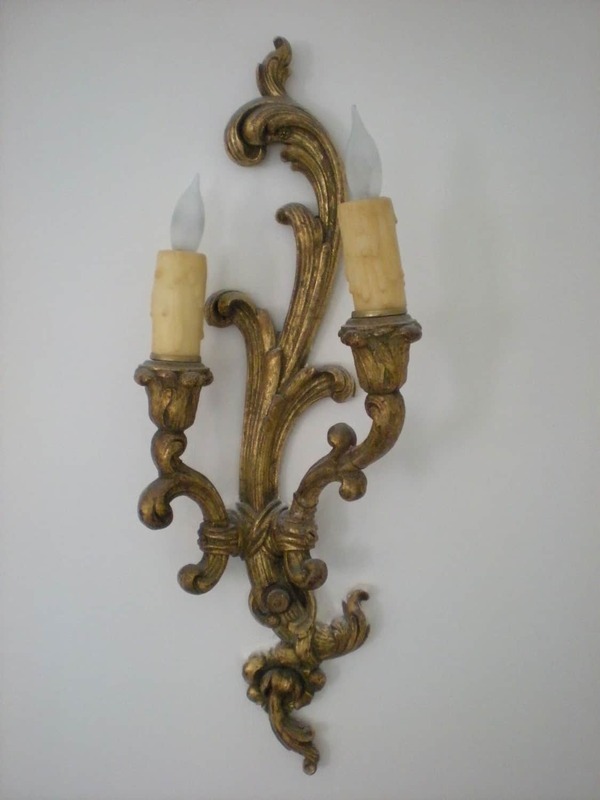 Just picked out some Suzanne Kasler sconces for a client bathroom redo…it was hard to choose they are all so wonderful! . We did a whole flea market booth of pink accents. This is a beautiful before and after! I love everything about it! You have wonderful taste. You need to submit this to a publication. I love your timeless designing – just beautiful. Hope you're having a wonderful weekend. WOW! This is beautiful. What wonderful changes and what amazing pieces you have. And to have *lived* in Paris! I studied there for 2 months in college and it was such a fabulous experience. Thank you for stopping by. Very nice dining room and I love the mirror! Looks great and you can't beat the location. I love the painting your cousin did. What a great souvenir of your time there. wow, how beautiful. love the addition of the arch. You have done an amazing job created a classic space. 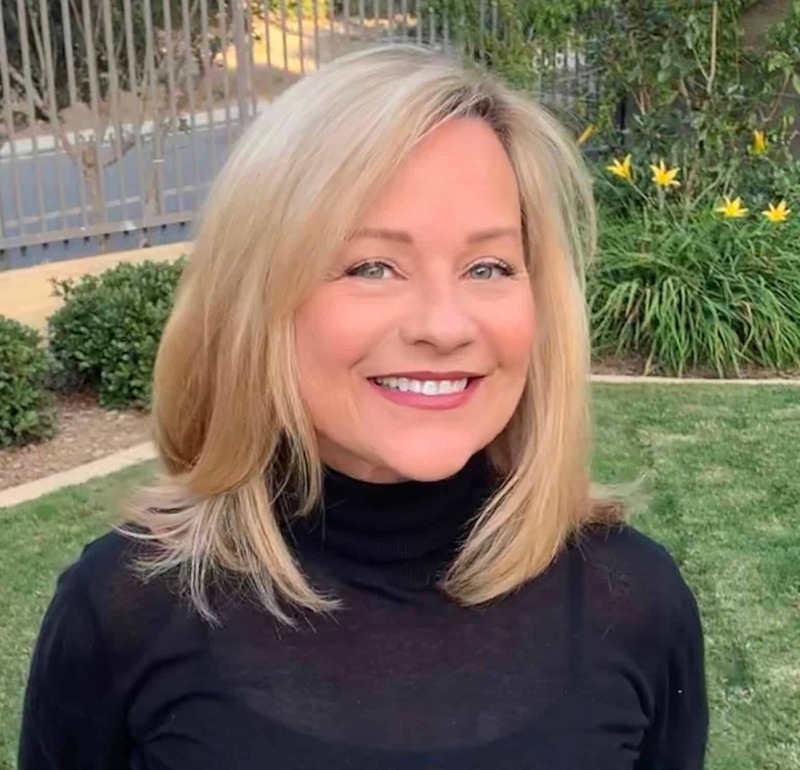 I am a new follower and will be reading some of your old posts so that I can catch up. p.s. I'd LOVE to visit my best friend in Irvine again but it probably won't be until next year. We're traveling a ton this year – Mexico, Italy, back to NYC so vacation days are really running out! Please do not turn off the tv on my account. Yes I have to admit that we are watching TV to at the litchen table, oh well at least we are all sitting together. 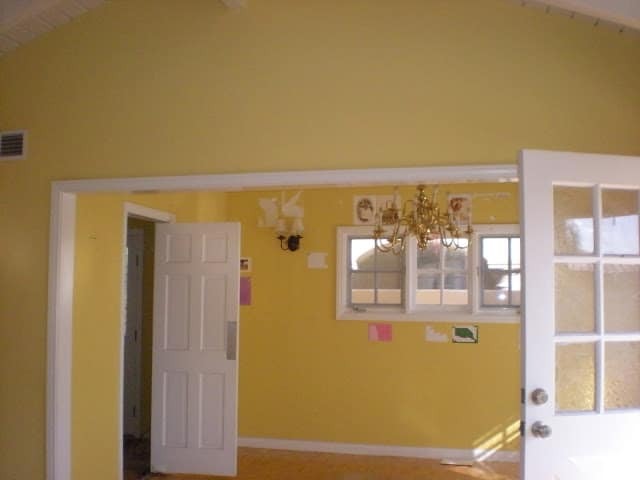 That was a good idea removing the window, and I love the alcove. Thank you so much for stopping by for a visit. So nice to have met you. I love seeing the "before and after" photos – you really did an amazing amount of work that paid off beautifully. I can't decide what part I like best.. heck I love all of it!! I know who I am going to have re design my house when the time comes!! I had a look at your kitchen and it's gorgeous. You're right…I LOVE the colours you've used. Yummmmmmmmy! The quality of your style is so upscale yet approachable and livable! It's truly beautiful and i can't wait to see more changes in this home. I love everything about this room. Beautiful yet comfortable! wow! You put in a lot of work. It looks great! I love the dining room re-do. Great idea for the niche, the arch AND I love the pop of green on the pillows. Thanks for stopping by curlywillowdiy.blogspot.com I will be keeping in touch! I just love what you have done here…beautiful dining chairs and outstanding tablescape. Love the transformation! Such a beautiful space. By the way, I can see my tv from the dining room too! 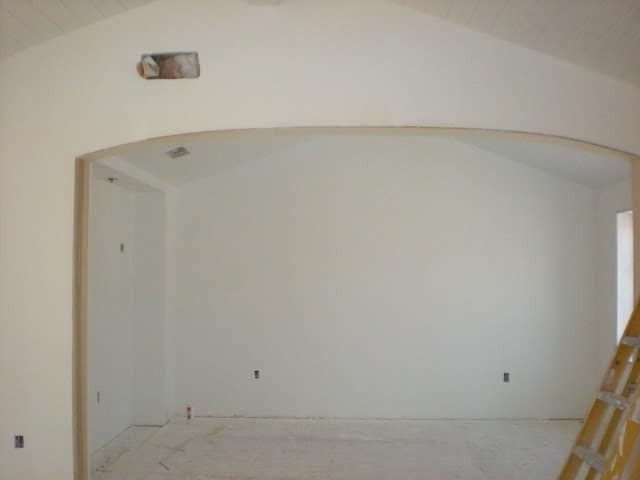 You did a wonderful job with the window…and I love the vaulted ceiling. Your chandelier caught my eye…it's perfect for your beach decor! Nicely done! Quite a transformation! You have some lovely things! 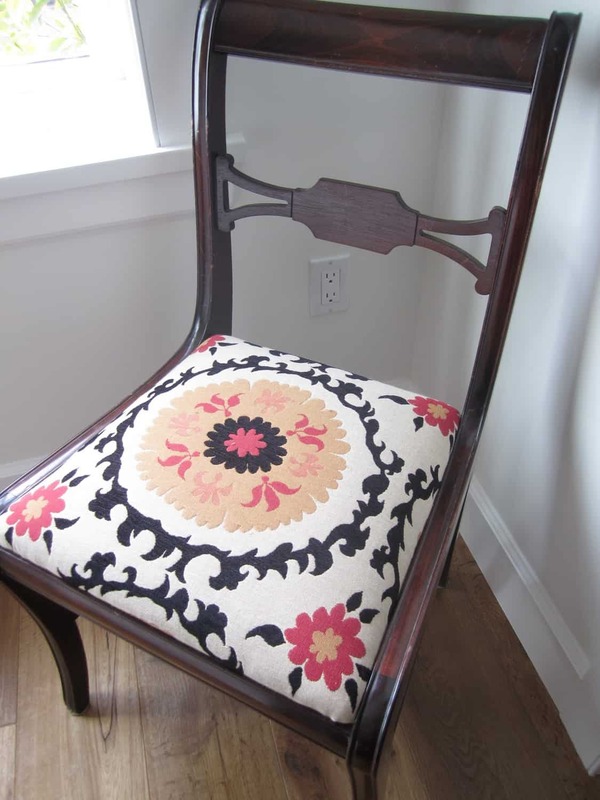 Thanks so much for visiting my blog and commenting on my daughter's room re-do. She has loved all the comments! And…wuh!!!! 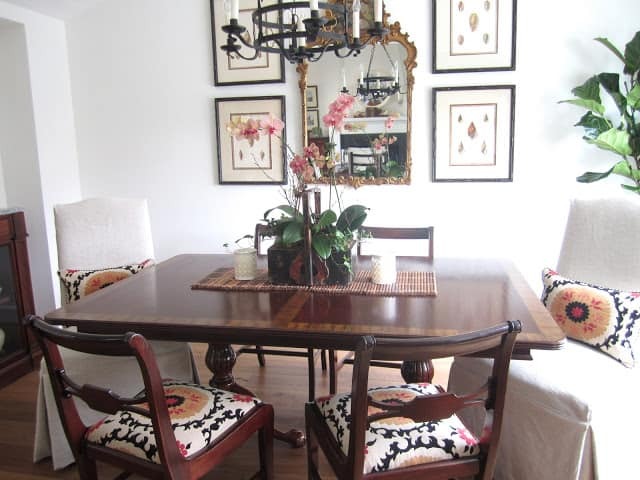 Your dining room is GORGEOUS! I love the ceiling, and your accessories are so unique. Your cousin's interior painting is so pretty. I love painting interiors! Great room! Dinner? I'll bring the popcorn! I love your dining room! What a difference. The sconces and the commode are beautiful. Gorgeous dining room! I love it! I'm really loving the slipcovered chairs! Wow – it came out great. And I do love the alcove where the door used to be. That really looks very nice. Mary Ann, beautiful space! 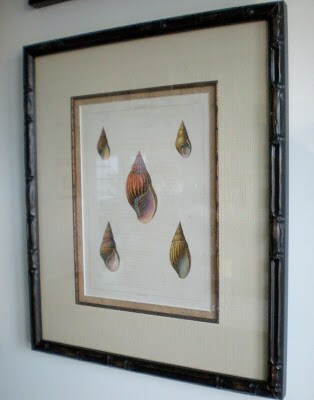 I love how you personalized it with keepsake pieces and your own history. Very fresh and light….good design. Thanks for visiting my blog, I am enjoying keeping in touch with other designers. 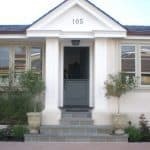 There is nothing like a fabulous Before & After to make my renovator's heart beat faster! You had a wonderful vision for this room Mary Ann & it's a triumph. Hi! I've just discovered your blog, and I have bookmarked it – I will be back! Your dining room is beautiful – I love what you've done with the space, and it's so beautifully decorated. Beautiful work and very elegant…thanks for sharing! Lovely. 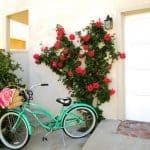 It's amazing how a few little things like taking out a window or removing a door (little in the sense that you're not adding space) can have such a big impact. I love your style Mary Ann. 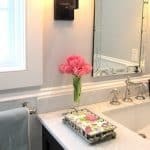 These pictures make me want to paint my newly painted rooms! Maybe I could just move in with you? I am going through your old posts and I love these rooms. Your dining room is gorgeous. Love the chandelier and that planked ceiling. I am going to add you to my blog roll so I don't miss a post. Goodness! So lovely! I'm intrigued by your arched doorway. Did you hire that out? I'm trying to figure out how to trim out the arched doorways we have. What did you do for the trim? It looks straight out of a magazine! Beyond beautiful. You are a lucky lady to have such a lovely place to dine. I've just been poking around your site a bit. So many great projects! I'm a new follower! Wow Mary Ann! This is seriously an astonishing post. The chandelier above the dinner table is f***ing brilliant! Such a pretty room. Reminds me a lot of my own, simple and elegant, nothing overly done. It has a very welcoming feel. Great makeover. That is absolutely gorgeous! It's far above and beyond what normal new luxury homes have today. 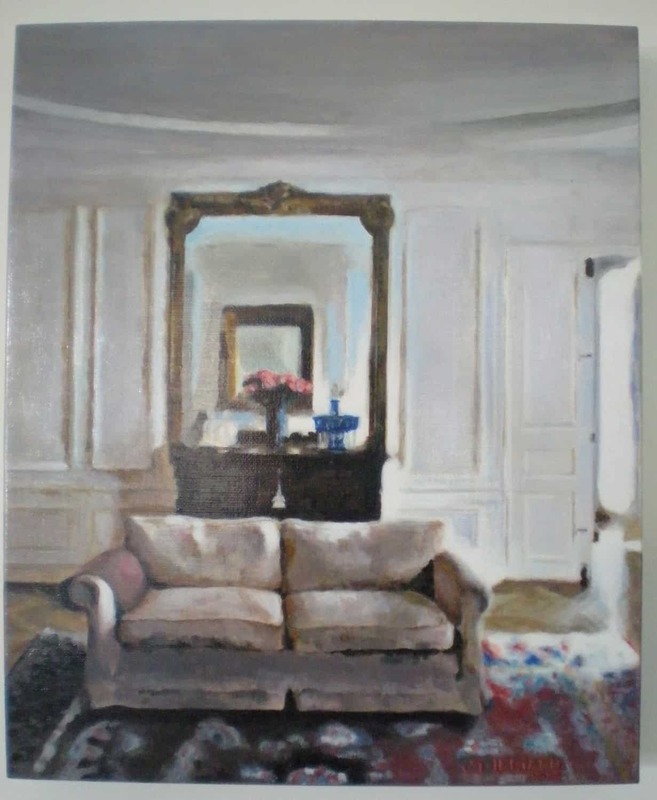 I really liked how you played with the lighting to really bring out that effect of the painting and bookcase.